November 25, 2009 November 25, 2009 Warners' Stellian Appliance4 Comments on Will Black Friday kill Thanksgiving? Will Black Friday kill Thanksgiving? Nothing says bah humbug like "cheap"-driven mobs. How did all of this Black Friday craziness begin? More importantly, where does it end? Is it going to push Thanksgiving right out the door? Black Friday, a term coined by the media to describe the phenomenon big box retailers created to get consumers to give up a night of sleep — and in more and more cases, a holiday with the family — to stand in line for a “deal” the day after Thanksgiving. Did the consumers ask for this, or did big box retailers create it? Consumers fear losing out on a discount they feel they really need — and that’s being played upon. Really, these prices could be available during normal hours, instead of forcing employees into work at 2 a.m. and encouraging dangerous frenzy. We used to love the fact we weren’t open on Sunday, but that eventually gave way to the reality of competition. I wonder if small family business and independent retailers will feel the open-early, hysterical Black Friday push in fear of losing a bunch of business. And then what? First 5 a.m., then comes 4 in the morning and then why not 3? How about we just kill Thanksgiving all together? Warners’ Stellian discussed being open early on Friday but decided the culture of our company and our employees mean more than a few extra bucks. Consumers can push back — and they are — according to a nationwide survey by the Minneapolis-based Institute for Local Self-Reliance that suggested independent businesses may be faring better than chains during the recession. Hat tip to WCCO’s Jason DeRusha on Black Friday ads/store openings. Great post! A good point that Black Friday as a phenomenon is not consumer-generated but created by national chain retailers as a way to kick up sales. For years, I haven’t shopped on Black Friday (more a result of circumstances than a boycott). This year, I’m in the mood to shop. But I’m staying away from the big box stores and the ridiculous 4 a.m. lines and crowds. I also avoid lines and crowds. Prices are important to me, but so is the shopping experience. If saving $5 puts me in a bad mood the rest of the day, it’s not worth it! I was sickened to see ads boasting about 3am store openings on Friday. Now I enjoy shopping in the middle of the night as much as the next person, but this is positively ridiculous. 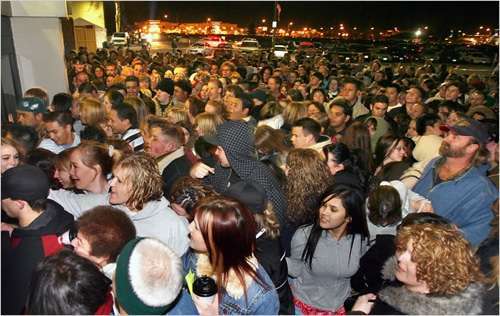 I predict that within a decade, “Black Friday” is going to start, if not at midnight, the day after Halloween.